It does not take much effort to appreciate the work of Alphonse Mucha. His art is endowed with an evocative effortless beauty, whichever the medium. Mucha is Art Nouveau’s most famous exponent, and with good reason. His work, or the Mucha Style, as it is affectionately known, is loved for its sinuous curves, waves and vegetation, and idealised female figures. It is a privilege for Malta to host an exhibition of his paintings, chromolithographs, photographs, and more. Such a feast for the eyes and the senses is a rare treat that no one should miss. Mucha shot to fame with the chromolithographs for the great diva Sarah Bernhardt’s production of Gismonda, which made him an overnight sensation in Paris in 1895. One of these chromolithograph posters is given pride of place upon at the entrance to the Malta exhibition. Similar chromolithographs for other Bernhardt theatre productions such as the Lorenzaccio also feature, as do others advertising commercial products including champagne labels. Good taste and sinuous beauty are the essential ingredients. The chromolithographs are indeed memorable, and the compositions deliciously diverse. One of the most dynamic is that for the 1897 Monaco – Monte Carlo P.L.M Railway Services. This shows a brunette beauty kneeling amid lush vegetation that forms a halo around her head and which further enlivens the composition in what seems to be an abstract floral wave. The four chromolithographs personifying the Arts are equally impressively sensuous, among many others. ‘In Quest of Beauty - Alphonse Mucha (1860-1939)’, gives a holistic view of the Mucha’s prolific career, and we get glimpses of a wide range of material: from jewelry to interior decoration, from light fittings to biscuit tins, from posters to oil paintings, from stained glass to book illustrations. The list goes on and on. Mucha’s talent can properly be appreciated when you come to terms with his sketches, and when you come to better appreciate the evocative nature of his technical ability and dexterity. The exhibition gives you this unique possibility. Truly evocative of this are the three oil paintings and the several works in pastel. The sketches include drawings of Bernhardt for several posters. Some pastel works are studies for the large oils on canvas paintings of the Slav Epic cycle produced for the Municipal House in Prague, which Mucha thought of as his masterpiece. The huge canvases were an homage to his country. The paintings in oil were to me, and I guess to many others, an unexpected bonus. Their visual intensity and tactile qualities are overpowering. This is impossible to appreciate in a chromolithograph poster. The latter are nonetheless remarkable for other reasons. 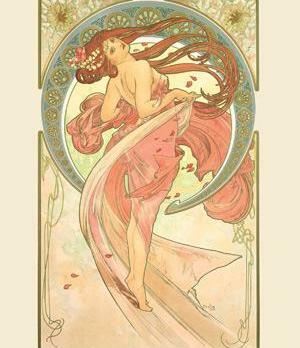 They too partake of Mucha’s sensuality and beauty. In the paintings, however, the figures and still life are freed from the constraints of the hard edge that is demanded of prints. The decorative images with stylised text, geometric decorations and, in particular, the stylised female figures, dissolve into a sfumato infused style that is mysterious and atmospheric. Their long hair that knows no end is not frozen in action but being gently stirred by a flurry of imaginary wind, forming playful swirls around the female beauties. The viewer’s experience is enriched by a documentary about the artist’s work and career. Several informative panels are, in addition, strategically located to conform to the different sections of the exhibition. Monitors also give added information about books Mucha illustrated. The Mucha Style was at its height an international sensation that conditioned many aspects of everyday life, including on restaurant menus, calendars and biscuit tins. It is a unique opportunity to see work of this nature in one of our national museums. ‘In Quest of Beauty - Alphonse Mucha (1860-1939)’ is open at The Salon, National Museum of Archaeology, Valletta, until May 15.